This backlight creates high-contrast silhouettes in high-speed applications. Part of the Monster Series manufactured by Spectrum Illumination, it is 5 – 10 times brighter than standard LED lights. Because of its intensity, it has been successfully used as a diffuse front light in many applications. Examples include high-speed bottling and canning operations. This light uses a specially designed optic over each LED that disperses the light evenly. When viewing the light without the diffuser, the individual LEDs actually appear brighter when viewed from an angle than when viewed from the front. The result is an even light, free of hot spots. 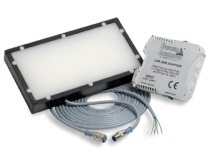 Please contact us if you’re interested in controller options, a different diffuser material, a longer cable, a high-flex cable, or a custom light size.